Combining traditional skills of observational drawing with digital design to create faux educational charts, maps and diagrams, Anna’s practice seeks to re-imagine and subvert the ways humans categorise and view the natural world. She blends languages of science and art to create intricate maps, diagrams, or visual references that invite the viewer to take a closer look to explore and get the most out of them, or to find the subtle subversions, often with a humorous undertone, and many with a London-centric viewpoint. She works with natural history imagery and methods of categorising and mapping, but most of her categorising is not scientific, but more ‘folk taxonomic’ in its nature; it is more social or based on local or personal knowledge. This exhibition of approximately 20 prints (screen and digital) will feature new work alongside some of her classic pieces, including the Dogs of London chart and map, the Peckham Cat Walk map and map. 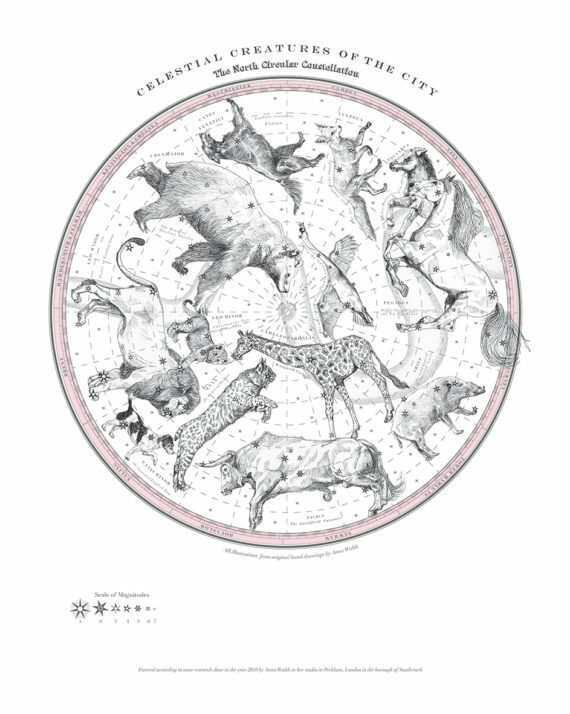 New prints include London Animal Stars, a series of 16 artworks created referencing animal myths and legends of London, mapped out with their corresponding star constellations. These will include The Hunting Dog Canes Venatici’ (Fenton the YouTube sensation dog who chased deer through Richmond park); ‘The Sea Monster Cetus’ (the River Thames Whale) and ‘The Great Bear Ursa Major’ (the mystery bear spotted on Hackney Marshes in the 80’s) among others. All these animals also come together in 2 prints, The North Circular Celestial Menagerie and The South Circular Celestial Menagerie, inspired by vintage celestial globes mapping the animal legends in the stars. Lessons In Things is an ongoing series of works exploring anthrozoology (interactions between humans and other animals) and is a direct translation of the French ‘Leçons de Choses’, which is taken from the title of a book of posters by Deyrolle, a Parisian Institution for natural sciences and pedagogy from the 20th century (now a shop and cabinet of curiosities), whose vocation is to ‘show the beauty of nature’, and whose imagery influenced many of the pieces in this exhibition. The English translation seemed an appropriately vague and arbitrary description for this body of work. Anna Walsh is an artist and designer living in London, and is a founding member of the art collective Garudio Studiage, for whom she has designed and illustrated products such as the ‘Dogs of London’ tea towel and ‘Cat Nap’ pillowcases which have been best sellers in places such as The British Library, The Museum of London and Selfridges. She has also worked alongside the other members on collaborative projects, displays and events for places such as the V&A and Paul Smith, and has work in many private collections, as well as Tate Gallery Artists’ Book Collection.